Created by the shamans of the Anasazi, until recently the Ghost Roads have been forgotten by all but the most arcane medicine men of the Navajo, Hopi, and Zuni tribes. Recently “rediscovered” as part of the Awakening, they have been instrumental in connecting various Awakened Indian tribes, and have seen much use by the Raven Cult, the Black Ghost Nation, and La Corona del Sexto Sol. Walking the Ghost Roads requires wearing a Ghost Mask. 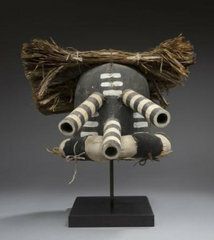 Basically an enchanted headpiece, a Ghost Mask usually takes the form of a scared animal, and is closely related to the masks worn by the Pueblo Indians. Creating a Ghost Mask requires a full month of preparation, and involves burning scared herbs, making frequent incantations in the form of holy songs, and performing a special dance to finally “awaken” the mask. In order to travel the Ghost Roads, the Walker must access one of the Ghost Roads’ “sipapu,” or “sacred doorways.” Named after the hole in a Hopi kiva that serves as the gateway to the ancestral world, sipapu can take many forms—medicine wheels, sacred rock formations, concealed caves, solitary mounds, hollows behind waterfalls, the cracked boles of ancient trees, actual kiva sipapu, and so on. According to ancient Anasazi belief, each sipapu corresponds to a star in the heavens, and the Ghost Roads reflect mystical constellations mapped across the earth. In order to enter the Ghost Roads, the designated Walker dons a Ghost Mask and activates a sipapu by spending a Power Point and making an Arcane Skill roll vs. TN-4. If successful, a wave of disorientation signals that the Walker has made the transition from the material “Fourth World” to the spiritual “Third World,” generally called the Hunting Grounds by non-Pueblo Indians. Although the sipapu seems unchanged, nearby features are concealed by fog, and there appears only a single pathway out. This trail invariably leads to the top of a broad hill, where the Great Kiva is perched beneath a night sky filled with strange stars. Numerous other pathways radiate from this kiva, although no man can agree on their precise number. Each path flows down the hill into the fog, and if followed, leads to a different sipapu. Unless the Walker is experienced, choosing the desired path requires a Spirit roll vs. TN-4. (However, some Hopi legends claim that a guide dwells in the Great Kiva—a terrible Ancient One known as Star-Flicker-Glossy-Man, who can take on many strange and terrifying shapes.) Once the desired sipapu is reached, the fog and disorientation pass, and the Walker may cross back into the material world. A Walker may guide “Companions” through the Ghost Roads by spending one additional Power Point for each accompanying soul. These Companions do not require Ghost Masks, but they must remain connected to the Walker at all times by a hemp rope, and each must keep his right eye closed. If any Companion loses his grip on the rope, or opens his right eye, he is expelled from the Ghost Roads and must make a Spirit roll vs. TN-4. If the roll is successful, he finds himself back at the original sipapu; if he fails the roll, he finds himself stranded at any sipapu across North or South America the Marshal deems an appropriate vacation spot. An individual Ghost Mask may only be used once each day, and if the Walker gets a critical failure on his Arcane Skill roll, the Mask is forever drained of power. Also, the Ghost Roads favor spellcasters with shamanistic or pagan manitous; while resisting those who derive their power from Judeo-Christian sources. For instance, a Brulé medicine man, a Mexican brujo with Aztec affiliations, or a Pennsylvania witch all find the Ghost Roads easier to access than a Mormon Salamander or a Golden Dawn sorcerer. This usually translates as a penalty on the roll needed to activate the sipapu, and is always at the Marshal’s discretion. Unused for centuries, the Ghost Roads have fallen into supernatural disrepair. Over the passing years, certain sipapu have been destroyed or subverted, while a few connecting pathways have mysteriously vanished. There are even some Ghost Roads that seem to have become corrupted, such as the “Path of Dark Ivy.” Always appearing at a different point on the Great Kiva, this labyrinthine pathway seems to lead nowhere, swallowing up all travelers as if they vanished into a black hole. The most dramatic effect of this disrepair, however, is that the Ghost Roads have become unanchored in time. Unwary travelers occasionally discover that they have arrive at their destination days, sometimes even weeks, before they left. In generally, the farther one travels in space, the further one slips back in time. So far, significant paradox has been avoided; but the Black Ghost Nation has been experimenting with ways to magically force this temporal distortion, thereby using the Ghost Roads as a serendipitous method of time travel. Trappings: Enacting this Power requires a specially-constructed “Ghost Mask.” Human sacrifice is required, and the victim’s heart must be carried as a fetish. Unknown to most modern Walkers, the ancient architects of the Ghost Roads were able to create temporary sipapu. These “black sipapu” required human sacrifice, and as such, were looked upon with various degrees of approval, horror, or indifference, depending on the culture of the shaman. The Aztecs viewed such sacrifice as a trifling affair, while the Anasazi forbade the practice, considering it a distortion of the spiritual balance. The only present-day practitioners who know how to create black sipapu are La Corona del Sexto Sol and the Black Ghost Nation. Neither has any desire to see this power reach a larger audience. In order to create a black sipapu, a suitable location must first be established. This may be a natural formation such as a cavern, well, or ruin; or it may be created using a medicine wheel, standing stones, or some other physical anchor point. Once established, the ground must be consecrated using blood magic. For every Walker to pass through the black sipapu, a human being must be sacrificed, his blood drained into the earth and his heart carried by the Walker. His Companions may accompany him as usual—separate sacrifices and hearts are not required. Other than these gruesome details, the spell functions exactly like “Walk the Ghost Roads,” with one additional detail. If a Companion opens his right eye or lets go of the hemp rope, he is not merely snatched from the Third World, he is slain. Using a black sipapu has the same limitations as the standard Power. Being by nature temporary gateways, black sipapu are subject to disruption and decay, and may need to be occasionally renewed by fresh sacrifice. I first got the idea for the Ghost Roads while staying overnight at the Hopi Reservation in Arizona. I just kept staring at a collection of kachina costumes, and later I dreamt that I met the “Star-Flickering-Glossy Man.” He looked like that weird star-man who used to pal around with Enik the Sleestak in Land of the Lost. (I just looked him up. Apparently he was a “Zarn.” Goddamn, that show was crazy…!) I was also re-reading Orson Scott Card’s Red Prophet, which featured a strange, mystical hill that captured my imagination as well. My dream was pretty meaningless—I’m certain it was more about Sleestaks than Ancestral Puebloans—but I combined everything together for my Deadlands game, and got the Ghost Roads. The images used in this section depict a Hopi mask, a kiva at the ruins of Mesa Verde, and two priests of the Hopi Horned Society. 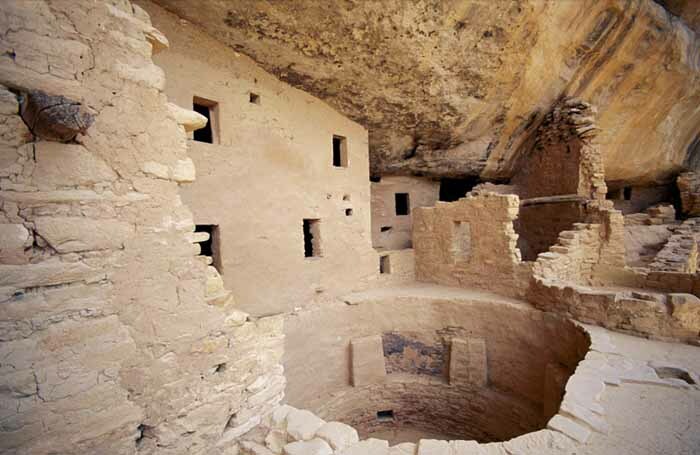 I would apologize for adding to the enormous pile of utter nonsense written about the Anasazi, from The X-Files to Pynchon’s Against the Day; but it’s not my fault their civilization is so tantalizingly mysterious!